A harness much more comfortable than standard harnesses. Increased ease of movement thanks to the Elastrac™ straps controlled extension. Right balance in between the strap flexibility and rigidity thanks to the proven concept of the Elastrac™ case. Elastrac™ strap lasts up to 10 times more than standard elastic straps. The case cannot be broken if used normally. 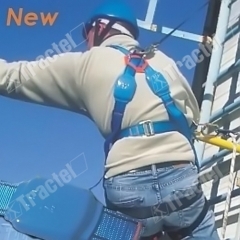 Elastrac™ strap much more resistant to climatic and chemical aggressions than standard elastic straps. 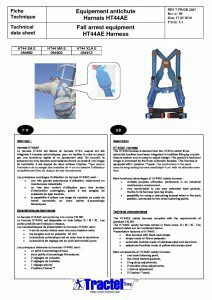 Increased security: control of the harness extension in case of a fall: +/-12 cm with a mass of 100 kg. Mountain leg strap with sub-pelvic straps. Independent leg strap for improved shoulder mobility. Complies with EN 361 standard. Available for HT 44, HT 45, HT46, HT54, HT55, HT56 and some of the technical Harnesses Models.